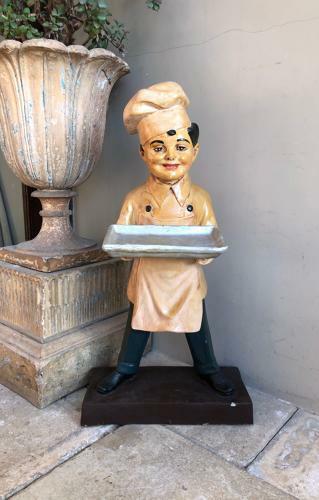 Great Size, Great Looking Bakers Advertising Boy complete with his Original Bread Tray...looks just like an Edwardian Bakers Boy but dates to c1950...made from a resin material. The tray sits nicely on his hands and someone has added velcro just so it cant come off. Lovely original paintwork. There are a couple of knocks and to the right side of his head there is a crack all solid though but have to mention. He is a good size so Collection or Courier only UK £45 (Not including Scotland).